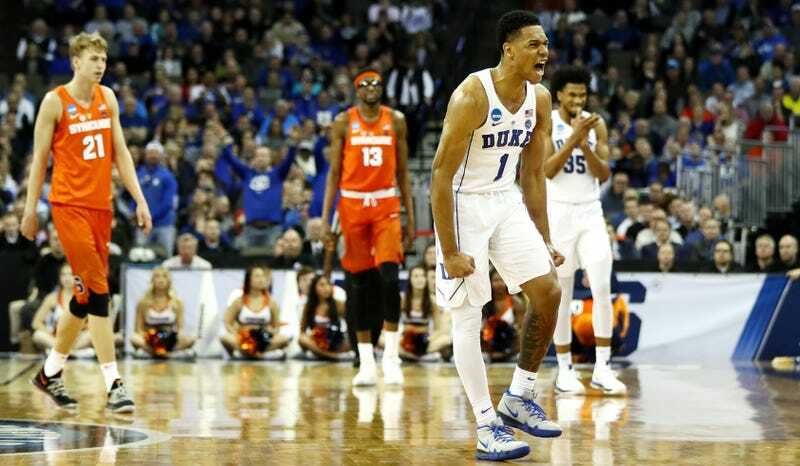 It sure as hell wasn’t pretty but Duke did what it had to do by scoring more than 60 points, and the Blue Devils sent Syracuse packing as they secured their spot in the Elite Eight. Duke beat Syracuse 69-65 Saturday night, fueled by another masterful performance from Marvin Bagley III. The rookie sensation led all scorers with 22 points, while the Blue Devils also received a double-double from fellow freshman Wendell Carter, Jr., who commanded the boards for every single minute he was on the floor. The Orange relied on Tyus Battle to keep their offense active and competitive; he powered Syracuse with 19 points and five assists. Beating the No. 2 seed Blue Devils was always going to be a tall order for Jim Boeheim’s squad. In Battle, Syracuse had a player that constantly moved the offense and prevented it from becoming static at every instance he could. This means he took some bad shots, but enough of those bad shots, like an off-balance runner over the hand of Carter, found the bottom of the net Friday that relying on the sophomore seemed like it might be enough. But with Duke running a halfway decent version, slightly modified version of the Orange’s own defense, it was necessary for Battle to have a a man in the middle that he could dish to in order to keep the Blue Devil zone honest. While center Paschal Chukwu served as a great baseline lurker and lob threat, it was Marek Dolezaj that had the most relatively impressive performance for the Orange. The freshman from Slovakia evolved into the perfect interior zone-buster—he hit short-range floaters; a tough mid-range jumper from the corner, slightly from behind the basket, right in the soft spot of the Duke zone; executed a pump-fake and kick-out for the corner trey from Battle; and crashed the boards and threw elbows with two soon-to-be NBA players. His run was brief, though, because he picked up his third foul by the eight-minute mark...of the first half. He still played a big role when he came back in the second half, even notching a late tip-in with 12.9 seconds remaining in the game to close the Duke lead to three points. But by then, the Blue Devils scored 67 points, and the game was over. In Syracuse’s first three tournament games, the Orange held their opponents under 60 points—this was kind of the magic number for them because, well, their offense isn’t exactly the kind of machine that can hang with the likes of an offense with Bagley. In the wake of Grayson Allen shooting what was probably a dozen too many NBA-range three-pointers (he was 3-of-14 from long range), Wendell Carter instantly became the most important Blue Devil not named Marvin, because he went to war in the paint for all those missed threes. If there’s one way to undermine a zone like Syracuse’s, a defense that requires a draining amount of energy to run effectively, it’s to consistently reset the shot clock and force those same defenders to face your 25-second set all over again. Carter and Bagley punished the Orange repeatedly—Carter finished with four offensive boards and 12 total, and Bagley secured a mind-numbing seven offensive rebounds of his own. Duke will now move on to face off with No. 1 seed Kansas in the Elite Eight on Sunday.